Since 2005, Mary Kelley’s 16 year-old-son has been hospitalized psychiatrically 36 times, lived in 7 different residential facilities, and been part of two therapeutic treatment systems. He has oppositional defiant disorder, ADHD, anxiety, bipolar disorder and borderline personality disorder. Back when it all started, Kelley had no idea what to do, where to turn or why it was happening. Now, sharing her story and speaking about mental illness is part of her life’s mission. She’s an instructor of a basic course on mental illness through the National Alliance on Mental Illness (NAMI), an organization that provides education, support and advocacy. It’s been around for about 30 years, and it started with two moms whose sons were both in a mental institution. Kelley was one of 4 presenters who spoke at a recent workshop on youth mental wellness in faith communities. 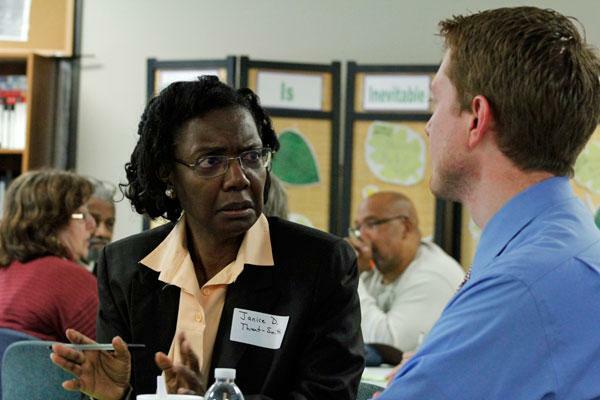 Janice Threat-Smith of For His Glory, Inc., speaks with Ryan Worley of the Youth Community Coalition at a workshop on youth mental wellness on April 30, 2014. The workshop, “Look up! Wake up! Step up!” was designed to equip faith leaders and lay people to better understand mental illness, learn to see the signs and better help their youth. 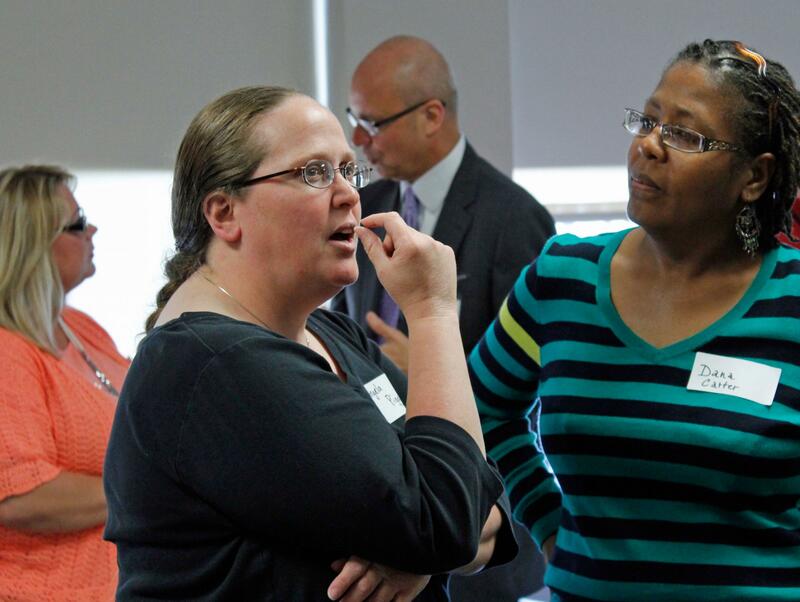 More than 30 people attended the workshop, held at Phoenix Health Programs in Columbia. Heather Harlan, a prevention specialist with Phoenix Health Programs, shared three key numbers. In other words, the teenage years are a crucial time for those struggling with mental illness. And that means youth leaders are among those on the front lines in recognizing the signs and responding. Ryan Worley, a coordinator of the Youth Community Coalition and a pastor with Karis Church, said research has shown that often, when people are struggling – whether it’s with a mental health issue or another issue – the first point of contact is often in the faith community. He spoke about the role faith communities have in the overall development of youth. They can help create a positive environment for youth to thrive in holistically, and help teens develop into well-rounded people. The Youth Community Coalition looks at youth development using a system of 40 assets – basically, building blocks of youth development. “There are 4 of the 40 that I think illustrate to you even more clearly how impactful your role is as a faith leader,” he said. Being in service to others, having positive peer influences and having positive adult role models are all assets present in traditional faith-based youth settings. And being in a religious community is an asset in and of itself. The more assets a young person has, the better, Worley said. It’s also important to look at risk factors – things in a young person’s life and environment that could be detrimental to their development – along with protective factors, or things that will help them excel. Two attendees of a workshop on youth mental health in faith communities practice expressing concerns about youth to one another, asking the question, "Could this child be ill?" Harlan said one of the challenges of recognizing youth mental wellness is that many of the symptoms are the same as normal aspects of teenage behavior. But there is a difference – it’s one thing to have a bad day, but it’s another to cry every day for weeks on end. It’s one thing to get frustrated or moody, but it’s another to punch holes in the walls. She had workshop participants practice expressing concerns to one another, to ask the tough question: Could this child be ill? I: How intense are the signs in question? L: How long has this been going on? L: How much might these signs be limiting the person’s usual activities? One problem is that despite the fact that no one is to blame for a mental illness – it's a brain disorder, not something caused by someone – there is still a strong stigma attached. And besides that, it’s not something that most faith communities talk about enough. 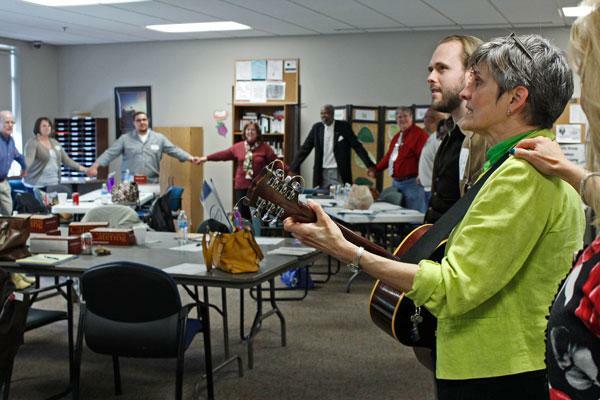 Heather Harlan, a prevention specialist with Phoenix Health Programs, leads the group gathered for a workshop on youth mental wellness in faith communities in a song. There’s an example given in some mental health circles: When a family member has cancer, or gets in an accident or has a surgery, faith communities are generally good at providing food and other types of support. But when you’ve got a family member with a mental illness, nobody brings a casserole. Presenters and attendees alike agreed that this is something that needs to change – faith communities need to make it OK to talk about mental health problems, and need to be more supportive of those who are struggling.